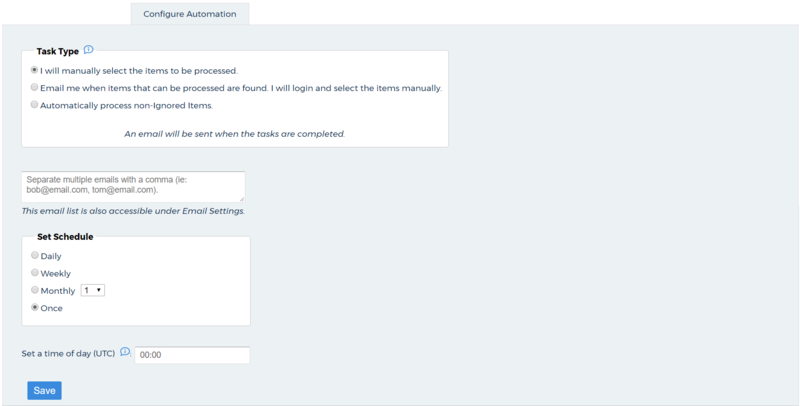 The Configure Automation tab allows you to set up how you want to process the tags returned during detection and how often and when you want CloudCheckr to process those detected tags. The next three sections describe how to configure your automation. I will manually select the items to be processed: allows you to select the tag keys from the EC2 tab that you want to be copied to the volumes according to the interval you selected in the Set Schedule section. Email me when items that can be processed are found. I will login and select the items manually: sends you an email alert when CloudCheckr detects any tag keys and allows you to login into the application to manually select the tag keys you want to copy to selected volumes. Automatically process non-Ignored Items: enables CloudCheckr to copy any tags that are detected to the volumes automatically with the exception of those tags that you added to the Ignore List. For all of these options, you will receive an email after each job is processed. Type the email addresses of the individuals who you want to receive an email any time new tags are available to be processed according to the configured schedule. If you have multiple recipients, separate each email address with a comma. You can also configure the list of email recipients by going to the left navigation pane and choosing Account Settings > Email Settings. 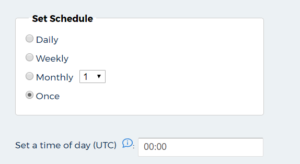 You can also type the time of day that you want the job to be processed using the Coordinated Universal Time (UTC), which is a 24-hour time standard used throughout the world.